The Droid 2 page is now available for your viewing pleasure on Motorola’s site and provides every detail you could possibly need if you still can’t decide whether or not this is the device for you. For whatever reason, Verizon seems to not be in much of a hurry to let anyone know about this device, but at least one of the parties involved has you covered right? Oh and this is basically all of the information we leaked to you over and over again throughout the last few weeks, but at least it’s been confirmed now, right? Experience speed, power and the Web like never before with the fully-loaded DROID 2 built on Android 2.2 with Adobe® Flash® Player built-in. Balance your social and work life with an improved QWERTY keyboard, fast 1GHz processor, 3G Mobile Hotspot1, push corporate e-mail and intuitive social messaging. Packed with memory and enterprise features, DROID 2 keeps pace with your life. Respond to e-mails quickly with an improved and more spacious QWERTY keyboard including larger keys and better tactility for easier typing. Keep connected to work with full push corporate e-mail, support for Microsoft® Exchange, unified inbox and enhanced features for IT compliance like remote wipe and password enforcement. Keep in touch quickly and easily via speedy typing with Swype® using one continuous finger motion across the virtual keyboard, or voice to text when on the run. DROID 2 delivers the ultimate Web experience with Adobe Flash Player to browse the Web as it was meant to be seen – with rich applications and content inside the browser. Share your wireless connection using the 3G Mobile Hotspot to connect up to five of your friends’ devices including PCs, mobile devices and other Wi-Fi compatible devices. Get up close and personal, exploring your content with pinch to zoom, all built on Android 2.2. Make your memories last with a 5 megapixel camera and DVD-quality video capture. Enjoy it all on the vibrant 3.7 inch screen with multi touch for easy navigation through enhanced media galleries. Showcase your newly captured content with family and friends using DLNA connectivity to download, stream and share on compatible devices such as a HDTV, game console or PC. Stay up-to-date with friends using the preloaded social networking widgets that allow you to sync and stream your feeds and updates from Facebook®, Twitter and MySpace to one screen in real time. Store your favorite videos, images, games and apps with 8 GB of onboard memory and a pre-installed 8 GB memory card, expandable up to a total of 40 GB with the addition of a 32 GB card. Customize your DROID 2 with tens of thousands of applications available on Android Market™. Use the multimedia station to transform DROID 2 into an alarm clock or digital picture frame or place in the car mount to instantly launch a full-blown GPS navigation device2. 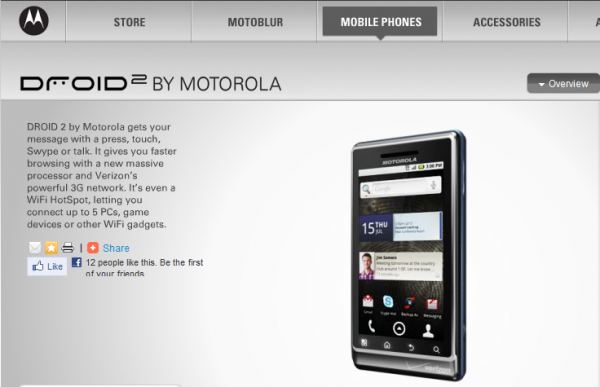 Verizon Sending out DROID X "Thank You" Packages?